Candle light exposure. Brightened a bit in photoshop. I'd like a bit more contrast for separation of items. tonal range could be improved in post processing. too gray. needs blacker blacks and brighter whites. Much too cluttered (for my tastes) to be restful though it does convey hobbies/ pastimes. Interesting reflection of board within glass. Seems very soft, and not in a way that enhances the image (for me). Interesting idea for the challenge. The focus seems a little off though. The chaos on the board is good. 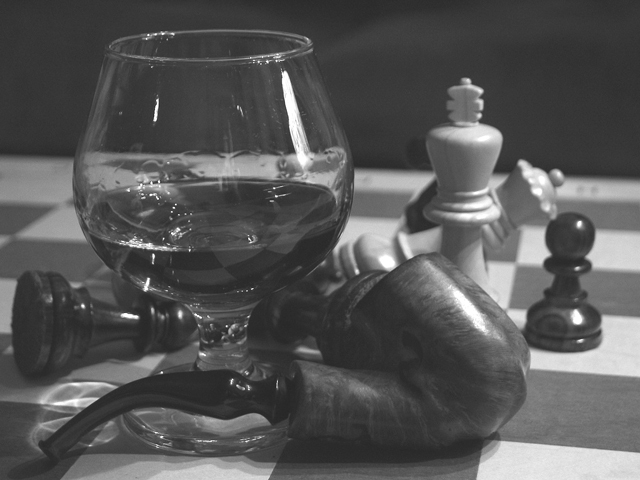 The pipe and brandy would look better beside the board, where they would be if this was real game. The pipe would at least be in an ashtray? Lighting is pretty good, maybe a little softer to preserve some texture in the highlight on the pipe and chess pieces and cut the glare off the glass. This shot is a bit washed out. Could have used more contrast. I like the reflections in the glass, good use of B/W. Would like to see more contrast in this image. Sort of "gray". Nice concept and good setup and lighting. Proudly hosted by Sargasso Networks. Current Server Time: 04/24/2019 11:51:09 AM EDT.